Our staff of septic experts is ready and waiting to tackle your septic engineering job in Lutz, FL. If your Lutz, FL home or business doesn’t have access to a nearby waste-processing facility, your only option may be to have a septic system installed. Septic system installation is no easy task, and the system must be customized to account for the number of bathrooms you have in your home or business. 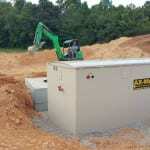 Fortunately, our team at Southern Water and Soil is always on call for septic engineering projects. Septic systems consist of one or more septic tanks (usually made from concrete) being used to collect water and waste from your home or business. After the materials are piped into the tank, the chemicals and bacteria in the tank get to work separating and processing the waste. The water then leaves the tank and goes into a drain field, where it is treated once more before being released back into the environment. Many people who have septic systems on their property do not understand how the system works, so they fail to perform routine maintenance tasks to keep their systems running smoothly. If you hire us for your septic engineering project, you can rest easy knowing that we will also be available for all of your septic repairs and other septic services. In addition to being experts in the field of septic engineering, our staff is qualified to install drip irrigation systems. Just like a septic system, a drip irrigation system must be custom-designed for your residential or commercial property. One of our septic engineering experts will be happy to come out to assess your property and give you a free quote. Whether you need a new septic system designed or a drip irrigation system installed, you can count on our expert septic engineering services. Just give us a call at Southern Water and Soil, and we will be glad to answer all of your questions and set you up with an appointment for your free evaluation.